So much so I truly believe peace should be a human right, not a rare commodity to fight for or a luxury that depends on money, politics, age and gender. And because of this belief I can't comprehend the abuse and injustice some humans are subjected to in their lifetime. It affects me deeply. In my field - birth - there is injustice too. Because money, politics, age and gender discrimination continue to prevent peace for some of us on this planet during our lifetimes. Women call me, text me or email me to tell me how abusively they have been treated during labour. I work for free as a volunteer at Sheila Kitzinger's Birth Crisis which means my phone number is advertised to women who need to tell their traumatic birth stories. My work there led me to set up a twin organisation in Spain (Escuchando con el Corazón). Then the Society of Spanish Obstetricians and Gynaecologists published a comic strip in their journal in which they openly and unapologetically laughed at women's bodies, birth and conditions. So we started a global movement to raise awareness of all the disrespect and abuse women were receiving around the world in relation to pregnancy and childbirth. 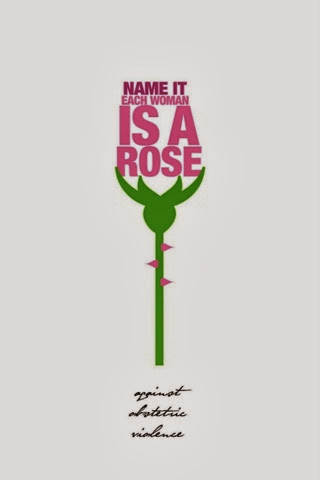 At The Roses Revolution we sometimes hear of women who’ve suffered horrific obstetric violence saying they would throw a stone rather than a rose, feeling our movement is too “soft” a response to what they have endured. But we also hear from organisations and individuals who will not support us because they do not believe in war or negative behaviour. Believe me, The Roses Revolution is as positive a movement as you’ll find after hearing a woman in tears telling you she wasn't able to sit down for a year because of what they did to her during childbirth. It is as positive as you’ll find upon seeing the bruises on a woman's belly left by someone jumping on her during labour to "help get the baby out". The Roses Revolution movement does not believe in any war beyond the war against ignorance. We stand united protecting women and birth professionals. And that is a difficult job. We are constructive, not destructive, because we have built a network in many countries around the world where women can feel supported and comforted by the truth that what happened to them was not fair or in any way acceptable. So they will pick up a rose and not a stone feeling empowered by the knowledge that many midwives, psychiatrists, activists, lawyers, doctors and many other women around the world share their pain and understand they were right to feel abused. We come in peace with a flower in our hand just to tell you that we as society have a problem and it is called obstetric violence. We want to name it, discuss it and be done with it, because we believe in peace and love in every birth. We believe humans in the 21st century should behave better, more lovingly with more compassion and understanding in all situations. But we also believe that remaining silent about the suffering of so many women and babies will make us just as violent, if not more so, than the ignorant institutionalised behaviour that allows this crime to perpetuate itself in so many countries and births. Constructing a society from a such violent welcome into life can never build a peaceful future.